The power and status of the press in America reached new heights after spectacular reporting triumphs in the segregated South, in Vietnam, and in Washington during the Watergate years. Then new technologies created instantaneous global reporting which left the government unable to control the flow of information to the nation. 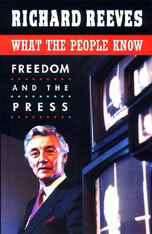 The press thus became a formidable rival in critical struggles to control what the people know and when they know it. But that was more power than the press could handle—and journalism crashed toward new lows in public esteem and public purpose. The dazzling new technologies, profit-driven owners, and celebrated editors, reporters, and broadcasters made it possible to bypass older values and standards of journalism. Journalists reveled in lusty pursuit after the power of politics, the profits of entertainment and trespass into privacy. Richard Reeves was there at the rise and at the fall, beginning as a small-town editor, becoming the chief political correspondent of the New York Times and then a best-selling author and award-winning documentary filmmaker. He tells the story of a tribe that lost its way. From the Pony Express to the Internet, he chronicles what happened to the press as America accelerated into uncertainty, arguing that to survive, the press must go back to doing what it was hired to do long ago: stand as outsiders watching government and politics on behalf of a free people busy with their own affairs.